UNITED NATIONS, May 2 2017 (IPS) - Censorship tactics have become more complex, posing new challenges for journalists and non-journalists alike, a new report finds. In its annual “Attacks on the Press” report, the Committee to Protect Journalists (CPJ) has documented a range of censorship cases from around the world and revealed a new world of media repression. “[Censorship] is definitely becoming more sophisticated and complex and is occurring at a variety of levels,” CPJ’s Advocacy Director Courtney Radsch told IPS. At the end of 2016, there were almost 260 journalists in jail, the most CPJ has ever documented. Turkey is the world’s leading jailer of journalists with over 145 imprisoned journalists, more than China, Egypt, and Iran combined. The country’s media crackdown deepened following the July 15, 2016 coup attempt and the subsequent imposition of a state of emergency which the Turkish government allegedly used to shut down over 50 newspapers, 30 TV channels, and three news agencies. The government also reportedly used anti-terror laws to imprison journalists, including the chief editor of Turkish daily newspaper Cumhuriyet Can Dündar who was sentenced to six years in prison on charges of disclosing state secrets, espionage, and aiding a terrorist group. Most recently, life sentences are being sought for 30 people with ties to Zaman newspaper, which is associated with Muslim cleric Fethullah Gülen whom the government accuses of organising the coup attempt. The newspaper has since been under government control. In Kenya, authorities are increasingly using a new mechanism to control the media: money. “As revenues drain away from traditional media due to the inroads of digital technologies, the use of financial-induced self-censorship, or ‘fiscing’, can also ensure that journalists are more ‘reasonable’ in their reporting,” said journalist Alan Rusbridger in the report. “Murder is messy. Money is tidy,” he continues. However, the control of information is not unique to developing countries, said Rasch. In the U.S., President Donald Trump has raised anti-media hostility to levels “previously unseen on a national scale,” said journalist Alan Huffman in the report. President Trump has consistently described some media organizations as “fake news,” most recently reiterating the claim that media fabricate stories during the Conservative Political Action Conference (CPAC). “They have no sources, they just make them up when there are none,” he told attendees. The president has also restricted and even denied access for reporters perceived as unfriendly, including those from Buzzfeed, the Huffington Post, and the Washington Post, and has threatened to change libel laws to make it easier to sue journalists and news agencies. 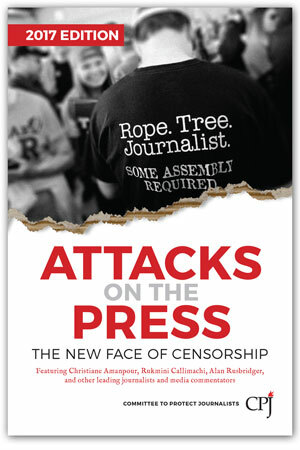 In one chapter, Christian Amanpour noted the similarities in such “poisonous” trends in the U.S. and around the world. “The same dynamic has infected powerful segments of the American media, as it has in Egypt, Turkey, and Russia, where journalists have been pushed into political partisan corners, delegitimized, and accused of being enemies of the state. Journalism itself has become weaponized. We cannot allow that to happen,” she stated. In Ecuador, the government has allegedly used social media as a way to suppress journalists. After tweeting that Ecuador’s former Vice-President Lenin Moreno had not paid income taxes, journalist Bernardo Abad’s twitter account had been blocked for violating its terms of service. By the end of the week, nine accounts had been temporarily suspended after also tweeting about Moreno’s taxes. China has taken this to the next level, making plans to link journalists’ online posts to their finances. Under the country’s proposed social credit plan, journalists who write or speak critically of the government could face personal financial consequences including decreased credit score or a denied loan. Such censorship goes beyond the business as usual tactics of shutting down reporters’ social media accounts to affecting journalists’ daily activities. Rasch highlighted the need to advocate for an open internet and the rights of journalists. “[We must] remember the importance of the press that continues to help us make sense of all the information that we are bombarded with all the time,” she told IPS. She also recommended journalists adopt secure communication practices in order to maintain their privacy and their sources’ privacy. Most importantly, journalists must stand strong and commit to fact-based reporting. “This is the best and most important way to fight back against the new censorship,” said Simon. “Journalists cannot allow themselves to feel demoralized. They need to pursue their calling and to seek the truth with integrity, honestly believe that the setbacks, while real, are temporary,” he concluded.